The remote is compatible with most models, so there may be subdivision functions that are not fully matched, this is the problem with all the universal remote control,but please rest assured that it will not affect the normal use. This product uses buitl-in lithium battery,charging input voltage of 5V. 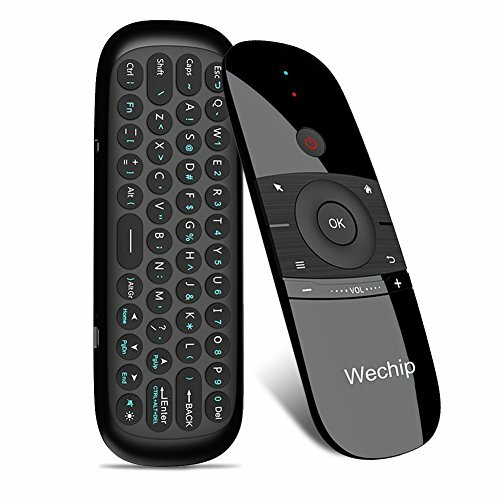  PLUG AND PLAY: Wechip remote with mini wireless keyboard is connected by a stable powerful 2.4GHz RF technology, just plug USB receiver,the transmission distance can up to 10 meters/ 394 inch. (2.4G meaning: wireless control mouse, no need to aim at the screen, can operate the cursor in any direction)(Samsung/Sony TV may not be compatible).  2-in-1 MULTIFUNCTIONAL REMOTE : Mini wireless keyboard and 4 Axis gyration motion system:only have 45 keys button,but can enter all characters in one. Press "Alt""Fn" to switch to punctuation or letters characters,allows mouse to be controlled accurately for motion sensing game,it's more convenient to operate in horizontal and vertical mode for games and typing.  AUTO SLEEP AND WAKE UP FEATURE: When the remote control for 15 seconds withot any operation,the remote control into sleep mode,blue light is off(Save Power). After the remote control ertering hibernation,press any key to wake up the remote control to enter the normal working condition.  LIFETIME WARRANTY: If you have any question about the remote control mouse,please click "contact the seller" in your order, we would be happy to solve it for you,we promise a refund or replacement if you are not satisfied,your satisfaction is our goal in any case. If you have any questions about this product by WeChip, contact us by completing and submitting the form below. If you are looking for a specif part number, please include it with your message.